These five innovative and captivating schemes of resistance to COP21 are still moving ahead despite France's protest ban. As a couple years of planning draw to a close, the protests in Paris around the United Nations Framework Convention on Climate Change conference, or COP21, are shaping up to be an edgy and diverse treasure chest of mass spectacles and organizing hubs. They will serve as a poetic contrast to what is widely considered government inaction on the pressing issue of runaway global temperature and the violence embedded in the terrorism of climate chaos. Now, after the French government outlawed mass protest following the November 13 attacks in Paris, the dedication of activists embracing this new reality as a way to encourage ever more decentralized, creative and committed action is nothing short of inspirational. An unwavering understanding that the “biggest threat to security, to life in all its forms, is the system that drives climate disaster” is fueling the actions being planned in Paris to shine a light on the state of emergency on the climate front. Ongoing conversations continue about the shape and tenor of actions during COP21, which will take place from November 30 through December 11. Many are brainstorming ways around the mass demonstration ban. The Climate Coalition is proposing a “Ghost March,” in which all the art and placards and props are placed in the street without the people; Avaaz is collecting shoes to stand in where people have been outlawed; ATTAC is considering a human chain, with people standing hand in hand along the main roads of Paris. And organizers are still making plans to have the call for climate justice heard on December 12, which is being referred to as D12. Meanwhile, banner painting and stenciling continue across Paris as the situation develops. Five of the most innovative and captivating schemes of resistance to COP21 that were put in motion are still moving ahead in some form. Telling their stories and plans is salve for the soul, and an antidote to the calls for violent retribution against ISIS. Overwhelmingly, as they move forward they also underline the importance of taking care of each other and ourselves — of an accurate assessment of risk and of avoiding harm. This won’t be easy in a shifting situation, but it’s essential. This moment also offers opportunities to do more outside of Paris in solidarity with the victims and survivors of all forms of terrorism — to draw the lines between the root causes of climate chaos and injustice everywhere. The first version of the Climate Games were played in 2009 versus a coal plant in Amsterdam. The games involve a mobile-friendly website with an interactive map that allows teams to form anonymously. Teams can add information onto the game field (the map) or retrieve information that would inform their actions. Then, action reports can be submitted, and teams can nominate themselves for awards. Some awards are just for laughs, but most serve as a genius way to encourage effective actions and reward helpful behavior. Awards will go to the most innovative tactic, the best supporter of other teams; the best model of courageous behavior, or use of the best Plan B; the best reporting on “Team Blue” (the authorities) or best modeling of solutions. Over 100 teams signed up prior to November 13. The very premise of the Climate Games that “we are not defending nature — we are nature defending itself” is a masterful re-framing. And publicly claiming the world as a giant direct action playing field for climate justice opens up opportunities for everyone to take part, wherever they are, and to identify the many aspects of “the Mesh” — or the real and pervasive system as represented by fossil fuel corporations, industry lobbyists and shill politicians — as it intersects with their own lives. As part of the Climate Games, a specific call was put out for participants to join actions surrounding the location of the COP21 on December 12, focusing on the theme of “red lines.” A red line is defined as a minimal necessity for a just and livable planet, and, for this day, specifically a call for sustainable energy transformation, justice for impacted people and the right to food and water. Blockades are planned that would use the red line theme to highlight solutions, and to shift the focus away from the talking heads in the negotiations to the resisters as part of the sustainable and just future beyond COP21. D12 is scheduled as the meeting closes and the officials head home to hold the governments participating in COP21 accountable, to speak the truth about any outcome that is less than what is needed, and to capture the last word. An indigenous contingent will be in Paris as part of the It Takes Roots To Weather the Storm delegation of over 100 frontline leaders from climate-impacted communities across the United States and Canada, including the Arctic. They come united under the slogan: No War, No Warming – Build an Economy for People and Planet. Indigenous people have a long history of participating in actions on the inside of the COP meetings, as well as engaging civil society on the outside. Sharon Lungo, who works with Ruckus and the Climate Justice Alliance noted that the delegation was inspired by the D12 call for actions on red line issues. “We realized, that we, the indigenous people are that red line — the most impacted, and last line of defense, for the rest of the world,” she said. As key stakeholders and frontline communities, they are uniquely situated to represent all aspects of resistance and solution-oriented work as warriors, protectors and keepers, upholding traditional wisdom. Grounded in this traditional perspective, the delegation identified several visual images to work with along the red line theme. Building on the image of frontline warriors, shields were identified as signifiers of their role as defenders of the earth and its communities. The indigenous women of Saryakyu, Ecuador, have built canoes that have been shipped to Paris, carrying their dedication to defending water, a sacred element of life, and the message that women are disproportionately impacted by climate change. It is their plan that the canoes will help to navigate not only the Seine river, but also a climate treaty that will protect and heal the earth for future generations. “I ask that as temperature rises, that we rise,” said Orielle Lake, who signed the Indigenous Women’s Climate Declaration. Within some tribes, red lines are used in traditional and ceremonial face paint. While honoring tribal protocol, medicinal uses and ceremonies, some will use red face paint, sashes and belts to embody the red lines themselves. In solidarity with refugees and undocumented indigenous people who are taking the brunt of climate impacts and violence worldwide, this contingent of directly-impacted people will speak out both inside and outside of the COP21 meetings to support other impacted peoples, recognizing that taking action on climate is essential to global stability and peace. One of the spaces that have blossomed in Paris is the Community Art Hub, which was started by The Eroles Project in conjunction with Jungle House collective and TierrActiva. Coming out of a 9-week Europe-wide artist-activist residency this summer in the Catalan Pyrennes, l’Annexe is serving as both a physical hub for people creating, organizing or performing creative climate interventions throughout the city, as well as a virtual home away from home for activists. The space will also host a kitchen crew to supply hundreds of meals for activists around the city; and space for workshops, immersive small scale theater pieces and political education — from legal briefings to de-stressing yoga, carbon colonialism to giant puppet workshops. Mona Rathsman, co-founder of The Eroles Project, emphasized their desire to host and hold space for “a culture of care and reflection, a space for activists to come back to and get nurtured and nourished.” Along with their daily programs, there will be opportunity for feedback forums, building on the culture of harnessing art critiques to make more effective art works. Physical and emotional support like this is always a welcome and needed piece of mass mobilization platforms; in the current context after the Paris attacks, increased global xenophobia and Islamophobia, it will play a critical role in providing the emotional support and healing that is needed. 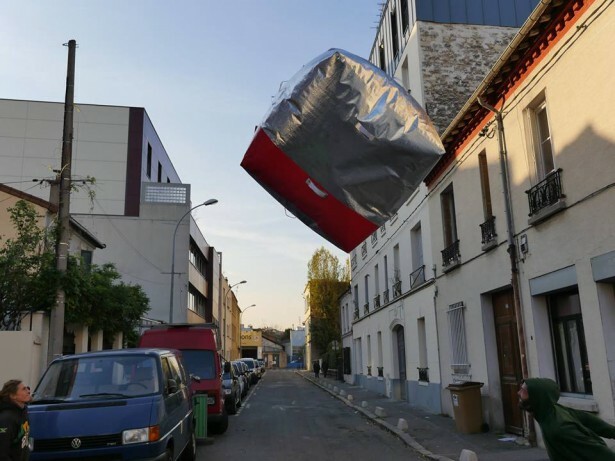 l’Annexe artists and activists have scheduled a number of out-of-the box provocative events in response to COP21, with the intention to stimulate more actions. “La Cantine des Nations Unies” is one of their political performance pieces in the first week of December, with specific instructions to participants: Bring a vegetable. It is billed as an evening to investigate how power and decision-making would play out if global political leaders were asked to cook together. With an ominous warning of potential natural disasters and political mayhem, it is not clear if anyone will get to eat. During COP21, a new constellation of groups challenging oil sponsorship of cultural institutions in Australia, Brazil, Canada, Ireland, France, Norway, the U.K. and the United States are collaborating to call on the Louvre to dump Total and Eni. These two oil giants sponsor France’s most prestigious art gallery as a way to divert attention from their ongoing and devastating fossil fuel extraction and human rights abuses around the world. Beka Economopoulos from the new Natural History Museum talks about recognizing that “politics are downstream of culture, and in order to shift the political climate, we have to enlist those institutions who control culture in our society.” Museums see more visitors in the United States than the number of people who attend all sporting events combined — a huge audience that is exposed to, or limited by, the information on display in the gallery exhibits. Koch Brothers sponsorship of exhibits on climate insure that their role in the devastation is never mentioned, of course. This new Natural History Museum works to create space for champions on the inside of these institutions to create change from within, and so expand whose — and what — stories are included and inscribed within mainstream galleries. For instance, if a display is about climate change, it would not just explain carbon molecules, but also the corporate sponsors. This strategy is meeting with success on several fronts, with several museums and cultural institutions coming out in support of divestment and cutting ties to fossil fuel companies in just the last few months. In Paris, a number of events designed to build the cultural divestment community are planned leading up to the Louvre event — and if you go, bring a black umbrella. As part of the closing events at the People’s Climate March in September 2014, the Climate Ribbon Tree was set up as a massive art ritual on the streets of New York City. The Climate Ribbon Tree’s leaves consist of ribbons inscribed with messages of climate love and loss from around the world, tapping into deep emotions that climate chaos can conjure for those internalizing its vast implications. Development of this creative ritualized action came from the strategic awareness that the enormity of the climate crisis often overwhelms people, acting as an obstacle to constructive action, leaving many immobilized in their fear. This interconnectedness shows up on climate ribbons that have been written by participants. Responding to the question, “What do you love, and hope never to lose, to climate change?”some answered, “The kindness among strangers,” “Safety for my grandchildren,” and “My country, Syria.” The Climate Ribbon Tree will welcome and embrace everyone in Paris to weave a fabric that connects us as we work for a healthy, sustainable planet. As the opening of the COP21 approaches later this week, artists, activists and cultural workers of all stripes are wrestling with sounding the right tone of response and resistance to the immediate violence experienced in Paris, Beirut, Baghdad, Ankara, and Yola. As protests and events are banned, continued acts of daily life can become acts of resistance and hope. Creativity, dispersed or distributed events, and drawing on traditional spiritual or community rituals offer a path forward for effective actions and powerful movement-building in Paris and beyond. Correction: The article originally stated that organizers were calling for mass civil disobedience on December 12, but those plans have since been changed. Having participated in a few slowdowns there is a huge relief from frantic and dangerous speed like working at an airport. While it may take sacrifice to ween off of the frantic drug like ways there seems thousands of ways to slowdown or reverse the flow of doing things to bring us back to a place where indigenous people are mostly already there. Reverse the flow of rivers and stream sending toxins into our oceans with cradle to grave clean products, taking out the endless oil and gas pipes using on the spot energy, recovering families and neighborhoods as people return home to work and have real backup from companies staying etc., Reversing the flow of arms to places like the M.E., slowing our cars down as we did in seventies to save lives today and fuel, etc etc. All offer great savings and quality of life enhancements with better appreciation. Would love to see a slowdown in Paris as corporations will be looking for it to end when it just begins. A ‘slow down’ is a wonderful idea for activists– and all citizens– of Paris during COP21. Slow downs have been used as effective resistance measures by many movements across the globe. Famously, the general public and activists in Santiago, and then across Chile used slowdowns to Protest Pinochet’s regime (https://www.nonviolent-conflict.org/index.php/movements-and-campaigns/movements-and-campaigns-summaries?sobi2Task=sobi2Details&catid=27&sobi2Id=25 ), and Danes used work slowdowns in factories producing war materials for the Nazis ( http://www.aforcemorepowerful.org/films/afmp/stories/denmark.php ). The symbolisms being planned as “effective communication” sound like things that no non-activists (ordinary citizens) would understand as having anything to do with climate change.